Plants were the first medicines known by humans. People believed in the healing powers of plants and have been using them as early as 60,000 years ago., The plants containing active phytochemicals were used to treat different diseases and alleviate pain. Due to the increasing use of herbs for therapeutic purposes, herbalism (the study of herbs) emerged and built the foundation of botany, modern medicine, and pharmacy. In the early nineteenth century, the isolation of medicinal active phytochemicals began and marked the beginning of scientific pharmacy. Herbs and medicinal plants were an area of interest for the ancient Arab physicians and scientists. Ibn-Hayan along with other Arab chemists extracted general and local anesthetics from Cannabis sativa, Hyoscyamus aureus, and Papaver somniferum. Approximately 350 species of medicinal plants were discovered by Ibn-AlBitar and other Arab botanists, physicians, and pharmacologists. Arabs have contributed a lot in the early development of herbal medicine. However, the number of scientifically well-oriented and experienced herbalists is few. Currently in Arab traditional medicine, less than 250 species of plants are still used for therapeutic purposes. This is due to the detrimental climatic and environmental changes as well as the ongoing destruction of their natural habitat in the Middle East. Nevertheless, local medicinal herbs are still in use for the treatment of different diseases. Plants such as Anchusa strigosa, Alchemilla vulgaris, and Calotropis procera were used in Arabic medicine for skin diseases. For the treatment of cancer, Arum palaestinum, Allium cepa, and Brassica oleracea were used. Traditional use of plants by the Arabs was reported in the literature for Bedouins of Sinai and the Negev. For the treatment of cough, Bedouins used the leaves of Artemisia herba-alba and Haplophyllum tuberculatum with milk as a drink. Cassia italica’s leaves tea and the roots of Convolvulus hystrix and Euphorbia hierosolymitana have been used for treating constipation. Leaves of Achillea fragrantissima, Varthemia iphionoides, and Haplophyllum tuberculatum were used to bath patients having fever. In traditional Yemeni medicine, it is believed that coffee enhances the effects of honey, moreover, honey and plain coffee have been used to treat anemia. In addition, coffee husk decoction flavored with cardamom and ginger is believed to have the best healing properties. In Bahrain, boiled roots or fruits of Citrullus colocynthis (murrah) are used for the treatment of jaundice and are also used as a cathartic, hydragogue, and diuretic. Plantago coronopus L. is also used traditionally in Bahrain as a laxative. A rich tradition is found in Saudi Arabia regarding the use of medicinal plants. Trigonella foenum-graecum L., locally known as hulba, is widely used among Saudi women for menstrual disorders. Hulba is also used as an aphrodisiac and in diabetes to control blood glucose level. Elettaria cardamomum Maton (heil) is widely used in Arabic coffee and traditional foods such as kapssa as a spice. It is also known for its health benefits as a stimulant and carminative. Curcuma longa L. (curcum) is used as a paste applied on contusions and sprain. Fruits of Piper longum L. (filfil) are used in the treatment for cold, cough, and headache. Lawsonia inermis L. (henna) leaves are widely used as a coloring agent for skin and hair. It is believed that henna reduces body heat and treats skin and liver problems. The most common traditional drink in Saudi Arabia is the decoction of Coffea arabica (qahwa). It is known for its stimulant and diuretic activity. Wood from Aquilaria agallocha (oud) is widely used in Saudi Arabia and is known as a carminative and an aphrodisiac. Cinnamomum zeylanicum (cinnamon), locally known as kurfah, is derived from Lauraceae family. The tropical tree of C. zeylanicum grows wild in India, Sri Lanka, Indochina, and Madagascar.C. zeylanicum contains diverse phytochemicals that were isolated and identified from its crude extract. Few of which include (E)-cinnamaldehyde,trans-cinnamic acid, trans-cinnamyl acetate, cinnzeylanine, cinnzeylanol, and cinnamtannin B-1. In a number of cultural groups around the world, cinnamon barks have been used as a flavoring agent/spice in different types of food. Traditionally and until today, cinnamon is used for gastrointestinal complaints as a stomachic and carminative agent. In aromatherapy, cinnamon oil is used to enhance the mood. As a diagnostic tool, cinnamon is used in selective olfactory defect test in individuals with Parkinson’s disease to diagnose Parkinson’s disease–related hyposmia. The ethanolic extract from cinnamon has been proven, by hot plate–induced thermal stimulation and acetic acid–induced writhing in mice, to have antinociceptive (analgesic) effects. Cinnamon, alone or as a combination with oregano and fenugreek, has proven to control blood glucose level in humans and animals. The study conducted on 60 Arabic patients having diabetes mellitus (DM) type 1 revealed a decrease in lipid and glucose levels. Cinnamon is used widely in the Middle East. It is often added to savory dishes in the Middle Eastern cuisine. Reported uses of cinnamon by the Middle Eastern women during pregnancy were for stomach aches and bloating. In a survey of 166 patients with diabetes using herbs in Jordan, 3.6% of the patients used cinnamon to control their glucose level. According to an ethnopharmacological survey conducted in Jordan, cinnamon was known to clean female genital system. In Saudi Arabia (Makkah Al-Mukarramah), an ethnobotanical research survey was conducted. According to this survey, the folkloric use in the Western Province of Saudi Arabia for cinnamon was as carminative, antiseptic, and for checking nausea and vomiting. As no ethnobotanical and ethnopharmacological study was conducted to study the knowledge and use of cinnamon in the Eastern Province of Saudi Arabia, this article will evaluate the knowledge and use of cinnamon in this region. A quantitative cross-sectional study was conducted in the common population living in the Eastern Province of Saudi Arabia. The duration of the study was 2 months, that is, January and February 2018, and it was conducted in the city of Khobar, Saudi Arabia. The target population was the public residing in Khobar City, Eastern Province of Saudi Arabia. Both male and female citizens irrespective of education as well as participants above 12 years were included in the study. Non-consenting participants were not included. The questionnaire used in the study was developed in English language and was translated in Arabic before handing to the respondents. The translation was carried as per the standard guidelines. The initial draft was prepared by an Arabic speaker whose second language was English, and it was back translated by another colleague with the same language competence. The English version was validated by two academic professors. The tool was content validated in two rounds of meetings by a panel of experts including two clinical pharmacists, herbalist, and two academic professors. All questions were content validated and had minimum content validity ratio above 0.81. The content validity index was 0.87. A total of 10 questions were included in the research instrument. The questionnaire consisted of five (05) sections that are demographic information; knowledge regarding cinnamon; prevalence of cinnamon use; part used, reasons for use, and health benefits of cinnamon; and source of information regarding cinnamon. The reliability analysis reported a Cronbach’s alpha value of 0.62. An online survey was conducted. Population-based sample size calculation was carried out and a convenient sampling method was selected. Official figure for the population of Eastern Province was reported to be 3,144,578 individuals. This figure was used to calculate the sample size using online sample size calculator. The required sample size was reported as 385. Data were entered in IBM Statistical Package for the Social Sciences (SPSS) Statistics for Windows, Version 22.0 (IBM, Armonk, NY). Data were expressed in sample count (N) and percentage (%). Chi-square (χ2) test was used to report any association between demographics and uses as well as knowledge regarding cinnamon. Statistical significance was considered at P < 0.05. All the participants were briefed about the study and a written informed consent was obtained from them. Subjected to participant willingness, the online questionnaire was filled and their response was recorded. This study was approved by the Department of Natural Products and Alternative Medicine, College of Clinical Pharmacy, Imam Abdulrahman Bin Faisal University, Kingdom of Saudi Arabia with approval number Ref. no. 2160002152. A total of 585 responses were collected and majority of the participants comprised adults (n = 435/585, 74.4%). Most of the participants were female (n = 535/585, 91.5%) and were married (n = 384/585, 65.6%). Almost half of them had a bachelor’s degree (n = 340/585, 58.1%). The summary for demographics characteristics is shown in [Table 1]. 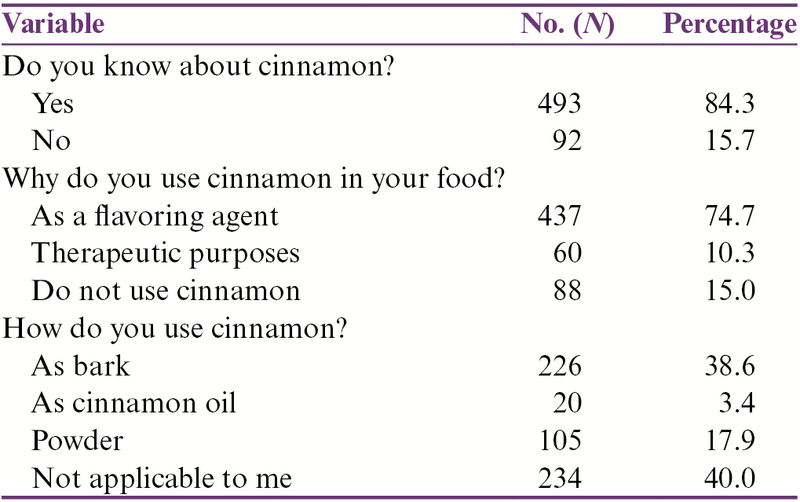 Majority of the respondents knew about cinnamon (n = 493/585, 84.3%). Most of them used cinnamon as a flavoring agent (n = 437/585, 74.7%). Almost one-third of them used cinnamon bark (n = 226/585, 38.6%). 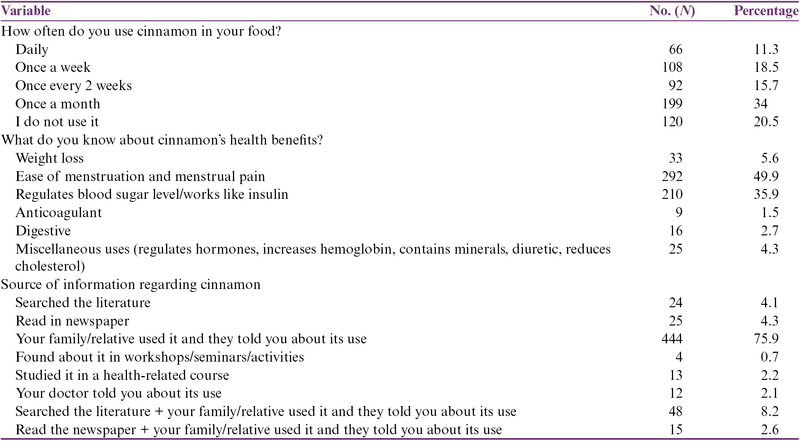 The summary for the knowledge about cinnamon use is given in [Table 2]. One-third of the respondents used cinnamon once a month (n = 199/585, 34%). Approximately half of the respondents believed cinnamon to ease menstruation and menstrual pain (n = 292/585, 49.9%), followed by the respondents who believed it to regulate blood glucose level and mimic insulin’s effect (n = 210/585, 35.9%). Furthermore, weight loss activity (n = 33/585, 5.6%), miscellaneous uses (regulates hormones and metabolic activity, increases hemoglobin levels, contains minerals, treats cold, acts as diuretic agent, and reduces cholesterol) (n = 25/585, 4.3%), digestive activity (n = 16/585, 2.7%), and anticoagulant activity (n = 9/585, 1.5%) were also reported by the respondents. Majority of the respondents knew about the benefits of cinnamon from their family members and relatives, that is, folkloric use (n = 444/585, 75.9%). The summary for health benefits/medical uses for cinnamon is given in [Table 3]. The prevalence of cinnamon use was reported at 45.47% for 2 months. The individual prevalence for different demographics are tabulated in [Table 4]. The demographics of the respondents such as age, gender, educational level, and marital status were cross tabulated with knowledge variables. The age was weakly associated with the knowledge of cinnamon (χ2 = 1.70, P < 0.42, phi = 0.05). Similarly, age was associated with the parts used (χ2 = 13.54, P < 0.05, phi = 0.15). Marital status and education were significantly associated with the same (χ2 = 64.7, P < 0.001, phi = 0.3 and χ2 = 22.4, P < 0.05, phi = 0.19, respectively). The summary of cross tabulation is reported in [Table 5]. Cinnamon as a spice is used since long in diverse cultures for various purposes. In addition to its culinary uses, cinnamon is known for its uses as antioxidant, antidiabetic, digestive aid, antibacterial as well as in respiratory disorders and gynecological ailments. The bark of cinnamon is used mostly for health and other purposes; however, the essential oil obtained from the bark may also be used for various purposes. On the basis of folkloric uses, cinnamon has distinguished uses among distinct population. An attempt was made to report ethnobotanical and ethnopharmacological uses and knowledge regarding cinnamon in cities located in the Eastern Province of Saudi Arabia. An overwhelming proportion of the respondents knew about cinnamon, and mostly they used it as a flavoring agent in their foods. Cinnamon is well known for its flavoring and aromatic properties and is used in various foods, bakeries, sweets, and drinks as a flavoring agent., Cinnamon is also used as a flavoring agent in pharmaceutical preparations such as toothpastes, mouth fresheners, and mouthwashes. Cinnamon is used in the Western cuisine with other natural products such as clove, anise, and nutmeg in baked gingerbread., Our findings were in line with the previous reports regarding use of cinnamon as a flavoring agent. 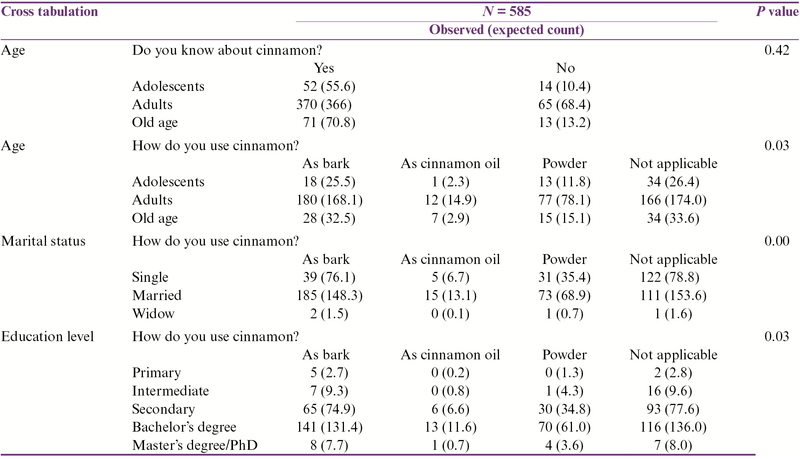 Though cinnamon is available as bark, powder, and essential oil, most respondents in our study used the bark. This may be due to availability and low price of the bark as compared to oil or powder. In addition, the storage requirements for cinnamon bark are relatively less rigid as compared to other forms. The bark can be stored at room temperature and used for up to 2 years, whereas powder has a shorter shelf life. Moreover, cinnamon essential oil is a concentrated product, which is mostly used for therapeutic purposes., Thus, the bark is more convenient to use for consumers. Traditionally, cinnamon has been used for treating DM in China. In addition, folkloric use and knowledge of cinnamon have been reported in some studies., Our study supports the use of cinnamon as an antidiabetic as reported by Ahmad et al. in the same population. A small fraction used it as a digestive aid and for weight loss. Cinnamon has been reported to increase the bile flow along with the total amount of biliary solid matters. Studies have reported the use of cinnamon in Jordanian pregnant women as a digestive and carminative agent. Hence, our finding supports the same. Regarding weight loss, cinnamon has been reported to reduce serum level of the total cholesterol, low-density lipoprotein, and triglycerides, and to increase high-density lipoprotein., As mentioned by Klop et al., one of the metabolic risks of obesity is hyperlipidemia. Cinnamon may be helpful in weight loss because of its antihyperlipidemic activity; however, no study has reported cinnamon’s weight loss activity. This is a novel finding, that is, folkloric use in the Arab community. The uses of cinnamon in our study were found to be attributed to the use by family or relatives and the knowledge from them. Three quarters of respondents used cinnamon based on its use in family. Hence, it was evident that the folkloric use of plants was a determinant use and knowledge regarding cinnamon. The folkloric use refers to the use of herbs in ancient times and its subsequent transfer through generations. This study provides valuable information regarding the use of cinnamon in the Arab community. Two major strengths were observed in this study. We developed a novel questionnaire that was content validated and subsequently translated in Arabic language. Another strength of this study was to document data from many respondents that exceeded the required sample size. The study employed convenient sampling that limits its generalizability across the Saudi population. Further studies are recommended in patients with diabetes and hyperlipidemia to investigate general knowledge about the herb as well as its use as it affects blood glucose level. Folkloric use of cinnamon was found to influence knowledge and usage of cinnamon in the Saudi population. Sumner J. A brief history of medicinal botany. In: Sumner J, editor. The natural history of medicinal plants. 1st ed. London, UK: Timber Press; 2000. p. 16. Health Statistics Annual Book. Ministry of Health. Kingdom of Saudi Arabia; 2014–15. Available from: http://www.moh.gov.sa/en/ministry/statistics/book/documents/1433.pdf. [Last accessed on 2017 April 27]. Sewell RDE, Rafieian-Kopaei M. The history and ups and downs of herbal medicines usage. J Herbmed Pharmacol 2014;10:1-3. Hoffmann D, Hoffmann FN. Medical herbalism: the science and practice of herbal medicine. 1st ed. Rochester, VT: Healing Arts Press; 2003. Saad B, Azaizeh H, Said O. Tradition and perspectives of Arab herbal medicine: a review. Evid Based Complement Alternat Med 2005;10:475-9. Bailey C, Danin A. Bedouin plant utilization in Sinai and the Negev. Econ Bot 1981;10:150-3. Regourd A, Hehmeyer I, Schönig H. Herbal medicine in Yemen: traditional knowledge and practice, and their value for today’s world. Leiden, The Netherlands: Brill; 2012. Abbas JA, El-Oqlah AA, Mahasneh AM. Herbal plants in the traditional medicine of Bahrain. Econ Bot 1992;10:158-63. Bajrai AA. Prevalence of crude drugs used in Arab folk medicine available in Makkah Al-Mukarramah Area. Int J Med Med Sci 2010;10:256-62. Bakkali F, Averbeck S, Averbeck D, Idaomar M. Biological effects of essential oils—a review. Food Chem Toxicol 2008;10:446-75. Hameed IH, Salman HD, Mohammed GJ. Evaluation of antifungal and antibacterial activity and analysis of bioactive phytochemical compounds of Cinnamomum zeylanicum (cinnamon bark) using gas chromatography–mass spectrometry. Orient J Chem 2016;10:16-25. Jayaprakasha GK, Rao LJ. Chemistry, biogenesis, and biological activities of Cinnamomum zeylanicum. Crit Rev Food Sci Nutr 2011;10:547-62. Ulbricht C, Seamon E, Windsor RC, Armbruester N, Bryan JK, Costa D, et al. An evidence-based systematic review of cinnamon (Cinnamomum spp.) by the natural standard research collaboration. J Diet Suppl 2011;10:378-454. AlJamal AR. Effects of cinnamon on blood glucose and lipids levels in diabetic patients (Type 1). Afr J Biochem Res 2009;10:181-4. John LJ, Shantakumari N. Herbal medicines use during pregnancy: a review from the Middle East. Oman Med J 2015;10:229-36. Wazaify M, Afifi FU, El-Khateeb M, Ajlouni K. Complementary and alternative medicine use among Jordanian patients with diabetes. Complement Ther Clin Pract 2011;10:71-5. Lev E, Amar Z. Ethnopharmacological survey of traditional drugs sold in the Kingdom of Jordan. J Ethnopharmacol 2002;10:131-45. Beaton DE, Bombardier C, Guillemin F, Ferraz MB. Guidelines for the process of cross-cultural adaptation of self-report measures. Spine (Phila Pa 1976) 2000;10:3186-91.
surveysystem.com [Internet]. Creative Research Systems, c2012. Sample Size Calculator; [about 3 screens]. Available from: https://www.surveysystem.com/sscalc.htm. [Last accessed on 2018 April 13]. Singletary KW. Cinnamon: overview of health benefits. Nutr Today 2008;10:263-6. Miller RL, Gould AR, Bernstein ML. Cinnamon-induced stomatitis venenata, clinical and characteristic histopathologic features. Oral Surg Oral Med Oral Pathol 1992;10:708-16. Ravindran PN, Nirmal-Babu K, Shylaja M. Cinnamon and cassia: the genus Cinnamomum. Boca Raton London, New York, Washington, D.C. CRC Press; 2003. Hili P, Evans CS, Veness RG. Antimicrobial action of essential oils: the effect of dimethylsulphoxide on the activity of cinnamon oil. Lett Appl Microbiol 1997;10:269-75. Ping H, Zhang G, Ren G. Antidiabetic effects of cinnamon oil in diabetic KK-Ay mice. Food Chem Toxicol 2010;10:2344-9. Jaafarpour M, Hatefi M, Najafi F, Khajavikhan J, Khani A. The effect of cinnamon on menstrual bleeding and systemic symptoms with primary dysmenorrhea. Iran Red Crescent Med J 2015;10:e27032. Marzouk TMF, El-Nemer AMR, Baraka HN. The effect of aromatherapy abdominal massage on alleviating menstrual pain in nursing students: a prospective randomized cross-over study. Evid Based Complement Alternat Med 2013;10:1-6. Ahmad R, Naqvi AA, Ahmad N, Baraka M, Mastour M, AlSharedah S, et al. Awareness, perception, attitude, and knowledge regarding complementary and alternative medicines (CAMs) among the pharmacy and medical students of a public university in Saudi Arabia. Arch Pharm Pract 2017;10:51. Anderson RA. Chromium and polyphenols from cinnamon improve insulin sensitivity. Proc Nutr Soc 2008;10:48-53. Lu T, Sheng H, Wu J, Cheng Y, Zhu J, Chen Y. Cinnamon extract improves fasting blood glucose and glycosylated hemoglobin level in Chinese patients with type 2 diabetes. Nutr Res 2012;10:408-12. Tabatabaee M. Use of herbal medicine among pregnant women referring to Valiasr Hospital in Kazeroon, Fars, South of Iran. J Med Plants 2011;10:96-108. Harada M, Yano S. Pharmacological studies on chinese cinammon. II. Effects of cinnamaldehyde on the cardiovascular and digestive systems. Chem Pharm Bull (Tokyo) 1975;10:941-7. Kim SH, Hyun SH, Choung SY. Anti-diabetic effect of cinnamon extract on blood glucose in db/db mice. J Ethnopharmacol 2006;10:119-23. Khan A, Safdar M, Ali Khan MM, Khattak KN, Anderson RA. Cinnamon improves glucose and lipids of people with type 2 diabetes. Diabetes Care 2003;10:3215-8. Klop B, Elte JW, Cabezas MC. Dyslipidemia in obesity: mechanisms and potential targets. Nutrients 2013;10:1218-40. Rauf A, Jehan N. The folkloric uses of medicinal plants in public health care. In: Rauf A, Jehan N, editors. Public health. Dover, DE: SM Group; 2015. p. 1-12.